As new wearer of CooperVision® products, schedule your annual eye exam with your Vision Source® optometrist to find out if a silicone hydrogel contact lens might be the right choice for your lifestyle. Aqua Clear® allows you to wear the lenses for up to 6 nights and 7 days. Thanks to our exclusive Aquaform® Technology, Biofinity® lenses allow plenty of oxygen to pass through to your eyes. Many enjoy the convenience of a daily disposable lens like Fresh Day®. There's no cleaning or maintenance, simply toss away on a daily basis. MyDay® is the latest in silicone hydrogel technology offering even less awareness of the lens. The MyDay lens is wonderfully soft - softer than other silicone hydrogel, daily disposable lenses - yet they're easy to insert and remove. Nearsighted, farsighted or astigmatism? Enjoy long-lasting comfort, the healthiest soft contact lens material1 plus high water content and Class 1 UV blocker2 with Avaira Vitality™ two-week replacement lenses. clariti® 1 day contact lenses allow up to 3x3 the oxygen to reach your eye, which makes for a healthier4 lens-wearing experience and whiter, brighter5, more comfortable eyes. Thanks to our PC Technology™, water molecules actually become a part of the Proclear® 1 day contact lens, creating a natural resistance to dryness. 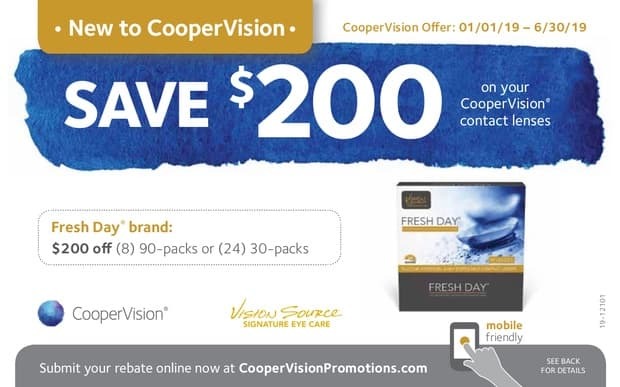 After purchasing your Aqua Clear®, Biofinity®, Fresh Day®, MyDay®, Avaira®, clariti®, or Proclear® contact lenses from a participating Vision Source® optometrist, download this rebate and follow the instructions to either receive a Visa® Prepaid Card or to donate a portion of your rebate savings to Optometry Giving Sight, an organization dedicated to providing sight to millions of people around the world. See rebate for details. 1. With higher oxygen permeability than hydrogel materials, silicone hydrogel contact lenses minimize or eliminate hypoxia-related signs and symptoms during lens wear. 2. Warning: UV-absorbing contact lenses are not substitutes for protective UV-absorbing eyewear, such as UV- absorbing goggles or sunglasses, because they do not completely cover the eye and surrounding area. Patients should continue to use UV-absorbing eyewear as directed. 3. Manufacturer stated oxygen transmissibility values (Dk/t): MyDay® daily disposable (100), dariti 1 day (86), 1-DAY ACUVUE® MOIST® (25.5), SofLens® daily disposable (24). 4. Data on file; clariti 1 day offers whiter eyes than 1-DAY ACUVUE MOIST. 5. With higher oxygen permeability than hydrogel materials, silicone hydrogel contact lenses minimize or eliminate hypoxia-related signs and symptoms during lens wear. Copyright © 2019 North Valley Eye Care, P.C.. All rights reserved.